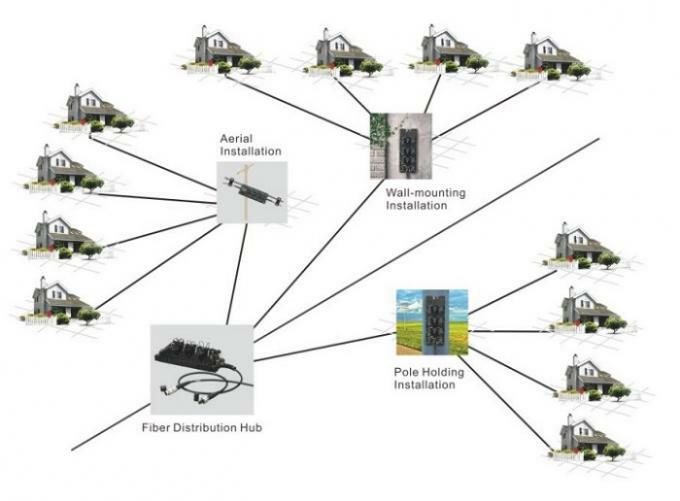 fiberHub is a new economic fiber distributed solution for outdoor use, compare traditional products, Fiberhub is easy tooperate and has high compatibility. 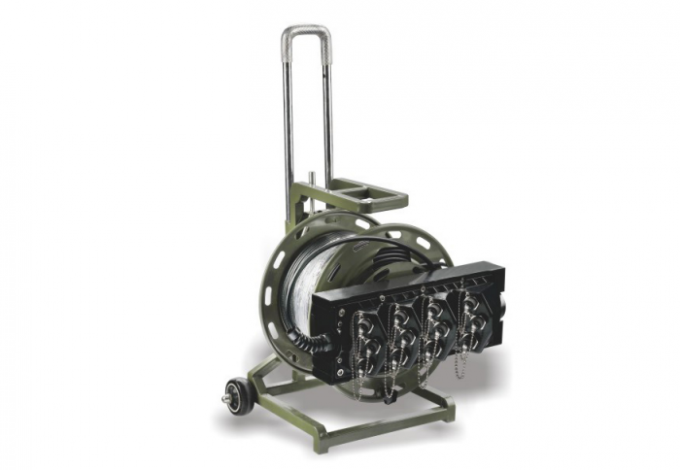 It can be used for wall-mounting, aerial installation or holding pole installation, base on different situation. 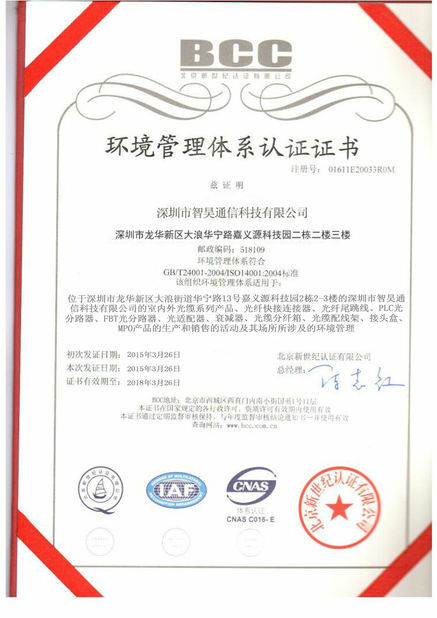 Fiberhub not onl used in FTTH field, but also used in FTTA or other harsh environment field. Traditional solution use ONU or FDH( optical network unit/fiber distribution Hub), when trunk opitcal cable arrives to outside of mansions and villas, Fiberhub can replace ONU or FDH becasue it has fiber distribution function. 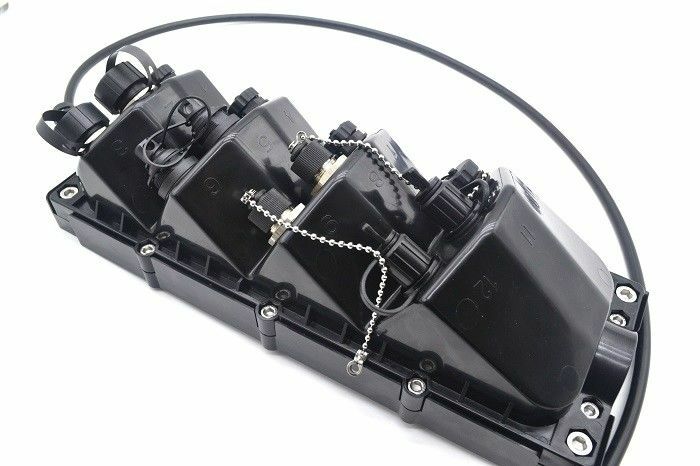 Inside, it can be fixed --4pcs 1*8 or 1*16 PLC, and can be put 24pcs fiber splice protection sleeves. 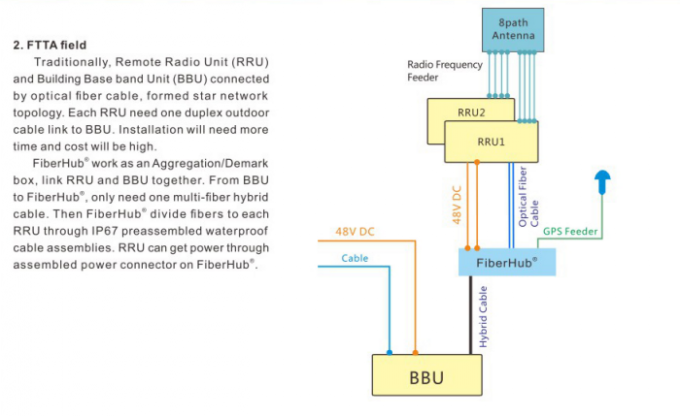 Traitionally, remote radio unit(RRU) and building base band unit(BBU) connected by optical fiber cable, formed star network topology. Each RRU need one duplex outdoor cale link to BBU. Installation will need more time and cost will be high. Fiberhub work as an aggregation/Demark box, link RRU and BBU togehter, From BBU to fiberhub, only need one multi-fiber hybrid cable. then fiberhub divide fibers to each cable. Then fiberhub divied fibers to each RRU through IP67 presassembled waterproof cable assemblies. RRU can get power through assembled power connector on fiberhub. Trunk cable needs to be fusion welded frequently because of each drum cable length limited. so connecting point is weak and need to be protected very well. When trunk cable comes into fiberhub, it will be sealed and fixed by torsion proof cable gland( plastic or metal type) for 5mm-14mm out diameter cable, fiberhub has different accessories to fit. torsion glad can relase stress when trunk cable bending and protect fiber avoid breaking. Inside of the fiberhub, main cable and strenght member where fixed by fastener, which make sure the box an stand of 1200N pulling force long term. The cable will be replayed frequently, when prospecting or millitary communication. Normal connector and cable cannot stand frequently and high strength pulling and resue. Inside of the fiberhub, armored cable and strength member were fixed by fastener, which make sure the box can stand 1200N pulling force long term. It's very suitable for field use, especially in star network communications. high strenght material and arc interface design make sure fiberhub work abnormally when suffer shocks. 3. Strong enough: working under 1200N pulling force long term. Carefiber views business from the customer’s perspective, sensitive to the pressures of a production environment. A good supplier is one you can depend on for quality, technical support, reliability, and fast delivery of components when you need them. We do our job so you can do yours. Quality is cost effective. Re-makes, delays and failures are expensive. 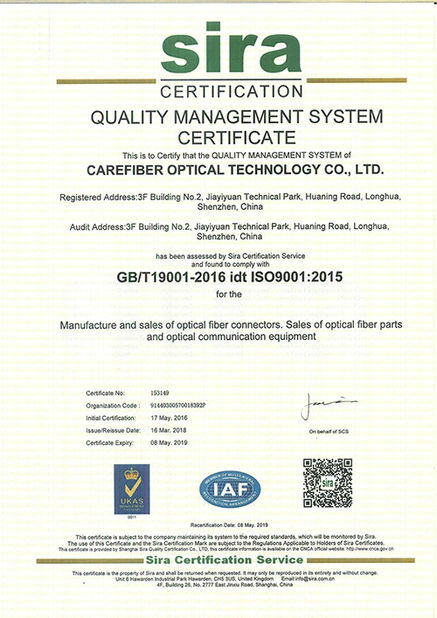 Carefiber stocks a range of quality components to anticipate the changing needs, as well as potentialproblems, that the customer (and other vendors) might overlook. We offer support and technical expertise in both the newest and existing technologies. Our aim is to make the business part easy. Carefiber works hard to be part of your success. We do business only with suppliers committed to supporting their products and the fiber professionals who use them, and we have long term relationships with these suppliers.